Physical touch is one of the five love languages, it is one of the senses that is important to processing information and emotions. In our independent and busy world it is a sense that is often overlooked because of awkwardness or just because we're in too much of a rush. 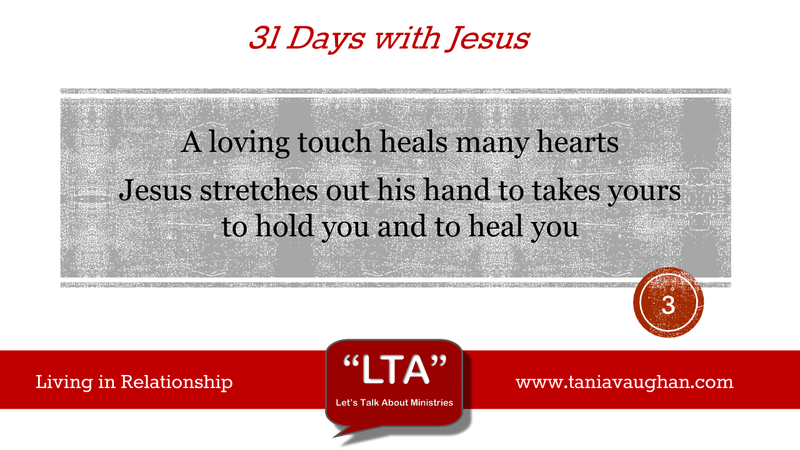 Jesus did not need to touch people to heal them, he did not even need to be in their presence. Verses 5-13 in chapter 8 tell the story of the centurion whose servant was healed by Jesus without him even seeing him. Jesus could easily skim a crowd and heal people from a distance and yet we see in verse 3 that he "reached out his hand and touched the man." This wasn't just any man, this was a man with leprosy; an infectious disease that affected peoples skin, nerves and limbs. A man with leprosy was not allowed within six feet of another human being, even his family. The disease could be spread through contact, so this man was probably never touched, and yet Jesus reaches out his hand before he heals him, and touches him. Did you know that The Leprosy Mission still work with sufferers of Leprosy in Asia and Africa today? Jesus knew that to stand back and heal this man would have been enough but Jesus wants a relationship, he wants more than to heal, and so he reaches out to touch a man that has not felt the touch of another human being for a long time. We see this same healing touch with Peter's mother-in-law in verse 15. Later, in chapter 9:25, he holds a girls hand as he brings her back to life and he touches the eyes of the blind as he gives them sight in verse 29. Touch is so important in a relationship; we hug our friends, hold hands with children and caress our spouses. When we have been hurt, either physically or emotionally, it can be difficult to accept physical touch. Abusive relationships left my heart hardened and I didn't like being touched at all, a gentle touch makes a person vulnerable and I had learnt not to be. When I found Jesus he had a lot of healing to do, one of the most significant has been that he did not just heal my broken heart, he changed it from a heart of stone to something much softer. He touched my heart and surrounded me with people who insist on hugging me, and he gave me an affectionate husband. I may not have liked being touched but it is something I needed, and still do, to ensure my heart does not harden again. It can be hard to respond to someone who stiffens when we move toward them to comfort them or who are ashamed or uncomfortable in their own skin. We need to reach out a hand, as Jesus did, and touch them, it is the only way that barriers come down and hearts change. We need to be brave enough to be in relationship with hurting people, who feel unloved and unclean. Do you need to let down your guard to allow Jesus to touch you? Is there someone you know who really needs a hug, to show them they are loved and accepted? Is there something in your past that makes you feel unclean or ashamed, that leaves you in fear of the vulnerability of being touched? Lord, I thank you that you do not only heal the things that can be seen but you reach out a hand to touch deep into the heart and offer love and friendship. I thank you that no matter my past or how I feel about myself you will never turn away from me, but will instead pull me into your arms. Lord, take away the fear of being vulnerable and help me to be open to your touch on my life. Show me those people around me that are in need of your touch on their lives, and use me to reflect your love and healing. As you rightly highlight, JC could have used a magic wand or a click of his fingers to heal the leper. We see elsewhere he uses a mud pack or just words. No JC understands the importance of touch in this instance - that touching a leper was not just unheard of but down right dangerous! this 'message' no doubt spoke just as loudl to an emerging church than the healing miracle. Touch is vital in relationships - if not not why do we feel insulted when an offered hand is not shaken? Powerful article. Thank you for sharing at The Weekend Brew.